You are here: Home / Culture and Media / The epitome of political art turns 80 – congratulations Klaus Staeck! 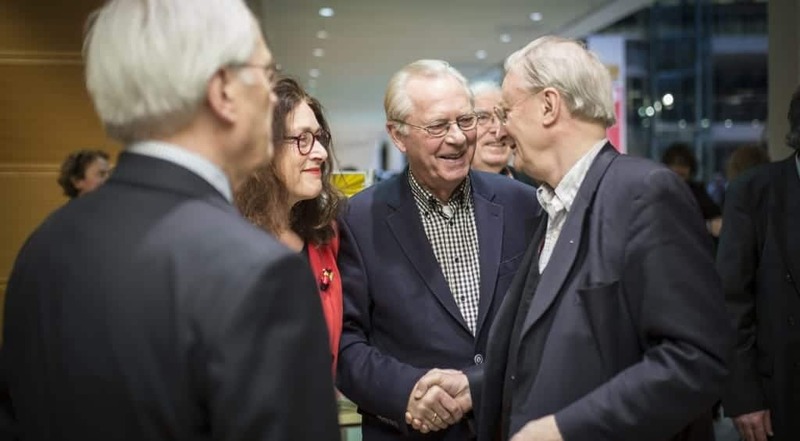 “Nothing is finished” – that’s the motto under which Klaus Staeck invited guests to celebrate his 80th birthday at the Willy-Brandt-Haus in Berlin. More precisely it was the Social Democratic Party’s executive, who organised the evening in Staeck’s honour. It turned out to be an entertaining event, which linked politics and culture in the most enjoyable of ways – but then, what else would one expect from a thoroughly political artist such as Staeck? Once again the graphic designer and cartoonist Staeck showed during the evening that he remains as active as ever, and that he is still trying, and succeeding, to lift others out of their lethargy. After a eulogy by the deputy chairman of the Social Democratic Party of Germany (SPD), Thorsten Schäfer-Guembel, there was a discussion with the new Federal Minister for Justice, Katarina Barley, and the spokeswoman for cultural policy of the SPD’s state parliamentary group for Saxony, Hanka Kliese after which Klaus Staeck proceeded to tell some humorous stories about being socialised in the former East Germany, about how the bourgeois is actually quite a fearful social group, and about his strong sense of justice and how it had led the 41 lawsuits that he had brought – or that had been brought against him. Thankfully, he won most of them. Staeck also relayed a number of interesting anecdotes from his youth. For instance, he once received a commendation at school for a wall newspaper that he did not actually make. It came after he was to be expelled from the school because a teacher had discredited him. The episode led to the other students becoming suspicious of him because, after all, he was the one to always step out of line. Besides being a gifted poster artist, agitator and someone with the ability to always encourage others Klaus Staeck is also a lawyer, a fact that has greatly benefitted him in life. Because he is a Protestant – and because, according to Staeck, Protestants always feel a responsibility for society – he once outed the two leading manufacturers of CFCs on large placards for a campaign by the environmental organisation, Greenpeace. Chlorofluorocarbon is considered a main cause for the destruction of the ozone layer and is also a contributing agent to global warming. Those who were named on the posters didn’t find the campaign very appropriate. They brought a lawsuit – which Staeck ended up winning. During Bernd Neumann’s tenure as Minister of State for Culture at the German Chancellery (2005 – 2013), the professional provocateur Staeck attempted to become president of the Berlin Academy of Arts. Staeck remembers the headline at the time in the daily national newspaper ‘Welt’: Two obsolescent models are to run Berlin’s cultural policy, the paper said. And that is indeed what happened: Neumann, of the conservative CDU, threw his weight behind the film industry and co-operated successfully with SPD member Staeck. During the panel discussion a poster behind Staeck, Barley and the other participants informed the audience that “one in two MPs is a woman”. In the accompanying photo however, only men can be seen. And that’s almost how things were until 1983 – the proportion of women in the federal parliament amounted to 8.3 per cent at the time. When the Green Party entered the Bundestag they brought with them a quota of around 50 per cent. Until the last legislative period, the overall proportion of women in parliament had increased at least up to 37 per cent. Now it is back at 31 per cent, a fact that’s primarily due to the presence of the right-wing populist AfD with its share of only 11 per cent. 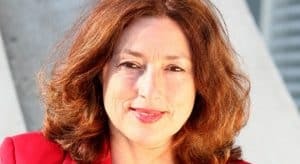 According to Katarina Barley, society needs more men like Klaus Staeck who possess courage and backbone: The rule of law, she holds, is the basis of democracy and society therefore must treat people like him, who always lay their finger in the wound, with care: “We need to break up inhibition”. At a time of “fake news” democracy thrives through discussion and not through rabble-rousing or hate speech, says Staeck. Artists with their great freedom can interfere and create publicity. Barley also made an appeal to women to become more solidary and to support each other more.